Ice melt and the weather. This is a climate web site with an emphasis on New Zealand but we are part of a wider World and events in other parts do have an effect on us even if it is only economically. It is widely known that the North Pole ice cap is melting in an unexpectedly fast manner. What is not so well know is how it disrupts the weather pattern in the Northern hemisphere and affects citizens in the cities of Europe and America and Asia. This is a very shortened version on some excellent work done by Jennifer Francis of Rutgers University and presented to the Meteorologist society of USA. There were originally about 11,000,000 square kilometers of ice in the North pole and that has reduced in its late summer minimum extent to 3,500,000 square kilometers and the argument is that this must have an effect of some sort. The area that has disappeared is about 40% of the USA or the whole of Europe. It has a two fold and linked effect. The first is to do with the seas heat and how this transfers to the atmosphere. Normaly fresh snow of the polar ice reflects 84% of the Suns heat and it goes back out into space but with the ice gone the Suns rays are soaked up by the dark blue ocean and warm the sea. In the Autumn when the ice should be re-forming it is delayed and exposes warm sea water to the atmosphere where there should have been ice. The ice would have formed an insulating blanket over the sea. In the warmer environment if the ice does not freeze and form an insulating barrier then the seas heat will warm the atmosphere, thereby reducing the deferential between the North Pole and the lower latitudes. It is the differential that drives the circular Polar winds and holds the cold air in the Polar region. When the differential is weakened it allows the cold air to spill out, causing abnormally cold spells all around the populated northern countries. Causing much disruption and comments concerning the end of Global Warming. The second linked result is to do with the Polar jet streams. These blow round the poles in a wave pattern that itself slowly progresses round the pole. With the loss of temperature at the Pole comes a change in barometric pressure that has the effect of deepening the waves of the jet stream and slows the progression of the system. The result of this is that the weather becomes stuck so that instead of having a snow storm that lasts 24 hours and passes on its way it stays for a week and creates havoc. The stuck weather patterns gave the UK its wettest summer on record and has created abnormal weather in many Northern countries. This scenario does not apply to New Zealand but we are all part of the same World and the countries in the North are important export markets for our products. Jennifer Francis lecture on Arctic ice loss. There are many predictions about when the North pole will be ice free at the end of the summer but it is shortening each year..
2012 was a very bad year for ice loss which pushed the graph into a steeper decline. This simple graph by PIOMASS paints a very dismal picture. This graph is not a forecast, it is a simple statistical graph. An ice free North Pole region would have dramatic effects on the weather in the populated North. It will definitively warm the Arctic region causing big changes to the weather. It will probably speed up the melting of Greenland. It will speed up the melting of Siberian and Canadian permafrost. The knock on effect would be to release more CO2 from the soil and also a large amount of methane. 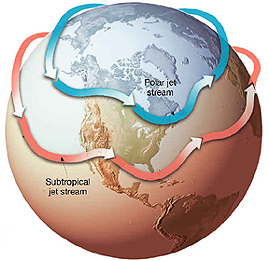 There is a constant concern that the extra fresh water from the melting ice will slow or even stop the flow of the Gulf stream which would affect the Ocean Conveyor and the whole World heat distribution system. All these thing have happened before but not with seven billion people on the planet,.